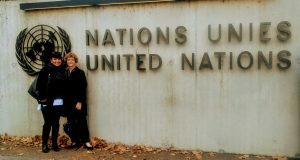 President JoAnne and Mary joined more than 1,200 Rotarians who gathered in Geneva, Switzerland, for Rotary Day at the United Nations. President JoAnne and Executive Director Mary McCormick. Rotary members “can transform a concept like peace to a reality through service,” said Ed Futa, dean of the Rotary Representatives to the United Nations. Alejandro Reyes Lozano, of the Rotary Club of Bogotá Capital, Cundinamarca, Colombia: As “part of the generation that grew up with uncertainty and fear,” as he put it, Reyes Lozano played a key role in negotiating an end to the 50-year conflict between the Colombian government and the Revolutionary Armed Forces of Colombia (FARC). Now he’s using a Rotary Foundation global grant to lead peacebuilding efforts among women from six Latin American countries. Safina Rahman, of the Rotary Club of Dhaka Mahanagar, Bangladesh: “Education is a powerful and transformative vehicle for peace,” said Rahman, a passionate advocate for workers’ rights and workplace safety who also promotes and provides educational and vocational opportunities for girls. Many thanks to the A.D. Robertson Fund for the United Nations for supporting our club’s participation in the Geneva Conference.